The UIC2 shift phenomenon was more pronounced in MDR1 cell lines with low levels of Pgp expression, reflecting lower molar Pgp/drug ratio in these cells, as compared with high Pgp expressors (34). This feature makes the UIC2 shift assay particularly attractive for Pgp detection in human tumors, the vast majority of which are characterized by low MDR1 expression levels (19-22) (Table 2). We used a series of MCF7 breast carcinoma-derived cell lines as a model of clinical breast cancer for standardization and comparison of different Pgp detection methods (Table 2). Three microbead calibrated cell lines, MCF7-P4 (low level of MDR1 resistance), MCF7-P10 (low-medium), and MCF7-P19 (high) were derived from parental MCF7-WT cells through in vitro selection for doxorubicin resistance. 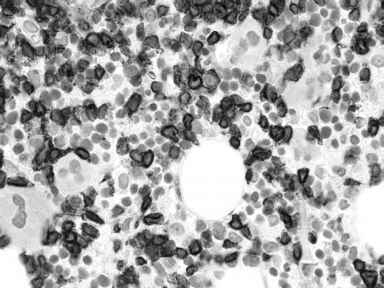 Results of the UIC2 Shift Assay with 25 ^M vin-blastine strongly correlated with the number of Pgp molecules per cell by flow (r = 0.98), IHC scores on formalin-fixed, paraffin-embedded samples (r = 0.98), image analysis on cytospins (r = 0.97), and IC50 values derived in a 4-d cytotoxicity assay (r = 0.78). UIC2 shift values were higher by a factor of four in low and low-medium Pgp expressing MCF7-P4 and MCF7-P10 cell lines (compared with the high expressor, MCF70-P19). This data, as well as other results generated on KB calibrator cell lines (Fig. 1), MDR1 retrovirus infected K562 cells, and MDR1-transfected NIH 3T3 cells (21), proved the usefulness of the UIC2 shift assay for detecting Pgp expression and function in transformed cells with low levels of Pgp expression. Fig. 1. The UIC2 shift assay on MDR1 cell lines. (A) Flow cytometric analysis of Pgp-positive FACS14 cell line stained with IgG2a labeled with phycoerythrin (PE; left) or UIC2-PE (right) in the presence of 25 pM of vinblastine (solid line) or diluent (DMSO; dotted line) at 37°C. UIC2 staining is increased in the presence of vinblastine, whereas IgG2a binding is not affected by vinblastine treatment. The UIC2 shift (arrow) is defined as the difference between UIC2 binding in conventional UIC2 staining and UIC2 staining in the presence of MDRl-transported substrates under physiologic conditions. (B) UIC2 shift in the parental K562 cell line and its subclones with intermediate (K562/1G2) and high (K562/i-S9) levels of Pgp expression. As compared with diluent controls (dotted line), exposure to 25 pM of vinblastine (solid line) does not affect nonspecific binding of IgG2a (isotype control) or specific binding of an anti-ICAM (CD54) monoclonal antibody at 37°C. 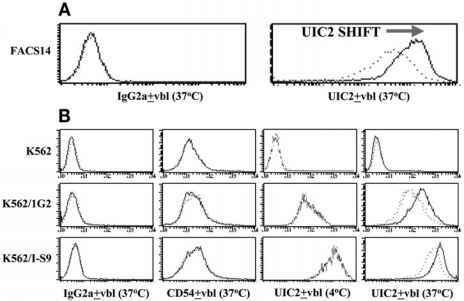 Because functional Pgp is required for altered UIC2 reactivity, UIC2 binding to the K562/1G2 and K562/i-S9 cell lines is increased in the presence of vinblastine at 37°C but not at 4°C. There are no UIC2 staining and UIC2 shift in the parental K562 cell line. "Determined for doxorubicin in the EDR assay. ^Doxorubicin concentration (pM). cMolecules/cell. eIHC scores were determined as described in Subheading 2. -^Absorbance product (see Subheading 2.). «Correlation coefficient from Pearson regression analysis; the date was correlated vs number of Pgp molecules/cell as determined by immunobead calibration. binding in the "low" (conventional) conformation but alter the intramembrane Pgp domain involved in the "high" UIC2-reactive conformation. Alternatively, this incongruity can be caused by inadequate sample handling: the half-time of Pgp on the cell surface is relatively high (>2 d; ref. 1), whereas the UIC2 shift assay requires healthy, non-ATP-depleted Pgp-positive cells. Some of our preliminary data indicate that overnight preincubation of tumor samples at 37°C in culture with 10% fetal calf serum or increasing the drug concentration to cell number ratio significantly improve the UIC2 shift ssay results (37). In vitro cytotoxicity based Oncotech's extreme drug resistance and differential staining cytotoxicity assays were used to correlate drug response to doxo-rubicin (a potent Pgp substrate) and 4-HC (a non-Pgp drug) with the UIC2 shift assay results in 124 clinical tumor samples. These assays have been extensively validated on more than 120,000 clinical tumor specimens to predict tumor drug resistance with high probability (>99.2%) (21). In our study, as expected, no correlation was found between the results of the UIC2 Shift assay and in vitro drug response in 4-HC-treated samples by extreme drug resistance or differential staining cytotoxicity. In contrast, doxorubicin drug resistance significantly correlated with Pgp expression determined by conventional UIC2 staining (p = 0.04) and the UIC2 shift assay (p = 0.02). These data demonstrates the link between the UIC2 shift assay and clinical Pgp-mediated drug resistance and suggests that prognostic value of the UIC2 Shift assays is higher than that of conventional immunostaining (36,37).